It is more or less an oral medication that is used to glean external results by clearing up such conditions as Acne, Lyme disease, acne cysts, and other irritable skin conditions. It can also act as an antibiotic for internal problems such as bacterial infections in the brain or prostate. In some cases it is used to treat cases of rheumatoid arthritis. 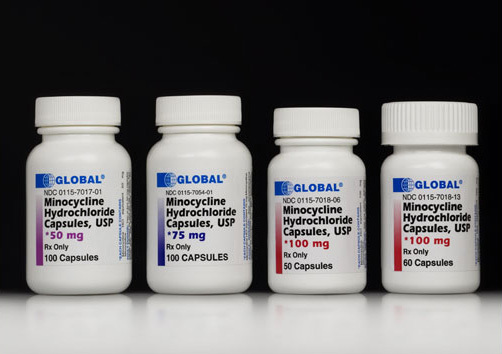 Minocycline is used primarily in the treatment of skin disorders for young adults and in treatment used to fight epidermal infections, as well as Lyme disease. Minocycline attacks and neutralizes the reproductive properties of bacteria. For this reason it is commonly used to treat acne. Acne is merely a form of bacteria that spreads over the outer layer of skin, thus Minocycline can contain the infection. Minocycline is also used to treat Amoebic Dysentery, Anthrax, Bubonic Plague, Respiratory Infections such as pneumonia, HIV, Rocky Mountain Spotted Fever, Urinary Tract Infections, Syphilis, Perioral Dermatitis and Cholera, among other diseases. The common dosage of Minocycline is one pill twice daily at 100 milligrams each. It has the ability to cross what is called the “blood-brain barrier,” and unlike other tetracycline antibiotics, a much smaller dosage acts on a bigger scale. You should not take Minocycline if you are allergic to it or to any other drugs of the tetracycline group (such as doxycycline, tetracycline, methacycline). Do not take it if you are allergic to any of the other ingredients it contains. Tell your healthcare provider if you have a history of any allergies. Do not take Minocycline if you have liver or kidney disease or systemic lupus erythematosus. 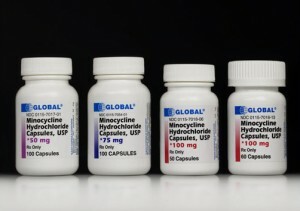 Some studies show that minocycline may aggravate the course of amyotrophic lateral sclerosis (ALS). Tetracyclines should be avoided by people suffering from mycosis or leucopenia. Very rarely it can trigger autoimmune hepatitis, thyroid disorders and systemic lupus erythematosus-like syndrome so monitoring of the treatment is recommended. A special attention is needed in patients with myasthenia gravis. Minocycline should not be given to children under 8 years of age unless it has been prescribed to them by a pediatrician. Minocycline can cause dizziness and vertigo in some people. That’s why you should avoid driving motor vehicles or operating machinery until you are sure how minocycline affects you. Tell your doctor if you have to undergo a surgery even a dental one before starting treatment with minocycline. Pregnant and breastfeeding women should not take minocycline. Inform your doctor about all the other prescription or over-the-counter medicines, herbs or dietary supplements that you are using. Minocycline is a prescription drug so you should never use it unless it has been prescribed to you by a physician. Minocycline is likely to cause photosensitivity. This means that your skin will be more sensitive to sunlight during the treatment and it can easily get sunburnt. That is why you should avoid intensive sunlight exposure during the time of treatment, use protective clothing and sun protection products with SPF at least 30. Always check the expiration date as tetracyclines are known to become toxic over time and cause a lot of adverse reactions past their expiration date.